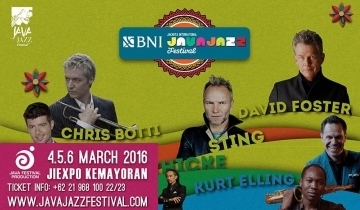 Sting and Chris Botti are the latest headliners to confirm that they will be performing at the upcoming Java Jazz Festival in early March. Java Jazz Festival will return to Jakarta International Expo (Jiexpo) at Kemayoran, Central Jakarta on March 4 to 6. Robin Thicke and David Foster are also scheduled to perform. Entering its twelfth year, the Java Jazz Festival is one of the biggest jazz festivals in the Southeast Asian region. I attended both dates in Java Jazz Festival. Those 2 days were simply the best time in my life! I got to meet Sting to and got an autograph, tho' I didn't get the chance to have a photo with him.. I hope Sting enjoyed being here in Jakarta, and please come back again and again. And I'll be coming to watch Sting again and again. I'll try to catch Sting up in other country close enough too.